“Plein air” literally translates as “open air”. Plein air artists paint in the open air and strive to experience the fullness of a single moment and capture the perfect essence of that moment with light and color. Similarly, we at Plein Air Life have a passion to produce handmade products that allow you to capture the essence of a perfect moment. Our palette comes from the best ingredients on earth, and our masterpiece is the serene feeling you have when using our products, confident that they are not only pleasing to the senses, but healthy for your body. As a mom (well, as a girl – and a girly girl at that!) I like to seize the opportunity to pamper myself when I can. I love hot baths. The hotter the better! Add some relaxing candles and a good book and I am in heaven. I also love clean, organic smelling bath products. Plein Air Life uses raw materials in their products – jojoba oils, essential oils, soy, and more. The scent of the items I received is AMAZING – the coconut reminds me of growing up near the ocean and how much fun it was to run along the beaches as a child. The sage is so soothing and soft, it instantly relaxes me. Plein Air Life also has gourmet lip balms, handmade soap, body spray and more in several fragrances – Lavender Rosemary, Jasmine Green Tea, Moonlight Gardenia, and others. You can also purchase the essential oils by themselves. I like to put a couple drops of essential oil on the top of a light bulb for a warming fragrance throughout my room. 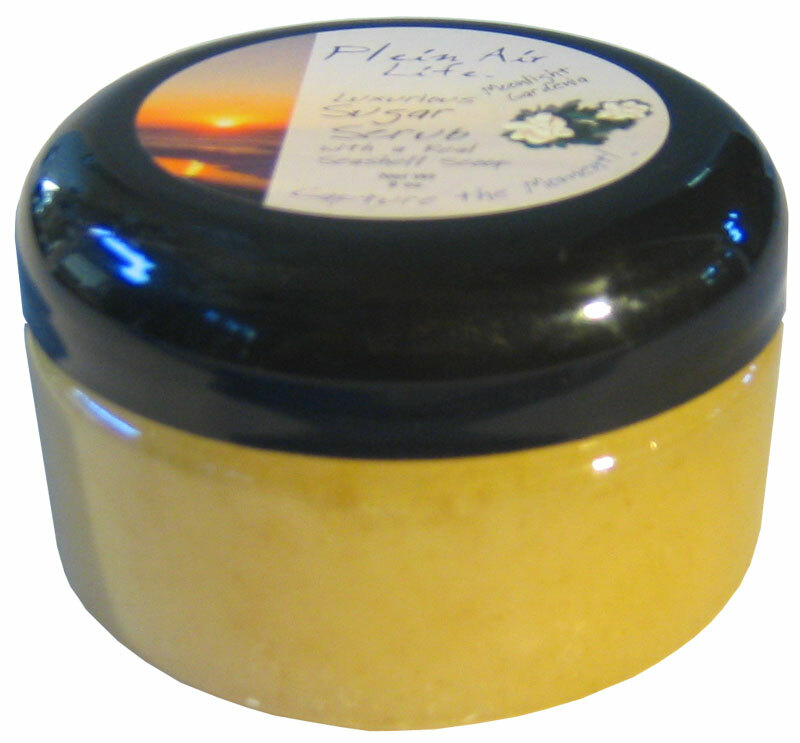 You can purchase Plein Air Life products directly at the website. If you are in Southern California, please visit their locations in Laguna Beach and Carlsbad! One very lucky reader will win a set just like mine! 9oz Sugar Scrub, 12-Hour Soy Candle, and 2.7oz Travel Lotion! Visit Plein Air Life and comment back with your favorite product or scent! The following can be done DAILY:Tweet about this giveaway! RT @mommywantsfree Win yummy bath products from Plein Air Life! Ends 01/11 www.tinyurl.com/mommywantsplein (1 entry per tweet per day) Giveaway ends Tuesday January 11 at 11:59pm PST. Winner has 48 hours to respond to my winning email! Please make sure to include your email in each comment unless it is in your profile. Giveaway open to US! I’d like to try lavender rosemary scent. I’d like to try lavender rosemary. I would like to try the strawberry lemongrass scent. I would LOVE to try the Cinnamon Forest Soy scent! I entered How to Shop for Free book giveaway. I entered Booty Shapers giveaway. I entered Lollisocks from Bimi & MImi giveaway. I entered A Dog’s Purpose giveaway. I like the Oatmeal and Honey Handmade Soap, 5 oz. product. I think the Lavender Rosemary would be great! I would love the Moonlight Gardenia Ultra-Moisturizing Lotion. Like Plein Air Life on FB. Entered How to SHop for Free. Follow you on GFC, screen name: KoiMom. I "Like" PALB on FB, screen name: Khanh N.
I post 1 comment about this contest on MWF on FB; screen name: Khanh N.
I entered several contests MWF on FB and left tons of comments on each thread. I love to try: lip balm, massage oil and moisturizer for hands and body from Plein Air Life Bath. Thank you! I subcribed vie email with you. I register with Twitter but couldn’t sign in to follow you on Twitter, will try to reset my password again. I would love to try the Jasmine Green Tea Soap! I am a gfc follower of yours ..Corky..